For the Kingdom of God is not a matter of words but of power. Imagine everyone is born and given a box, a treasure box. Its old and musty, with the most unusual lock. Not opened by a key but by a working of mechanism’s that are found all over the box. Most are not inclined to notice the box until they become aware of their own culpability in life. At which point, we ask about it out of curiosity. Our parents were given the instructions for opening the box at our birth. The words written on the scroll are in a language written just for each individual for which each box is given. No one but the box bearer can ever read the instructions. Upon asking, your parents give you your corresponding scroll. You unroll the scroll and find plenty of words, but even you don’t know what they say. Somehow you know the words are for you alone, but its all foreign language to your eyes! Frustration tempts you to think its all rubbish. What do you need in that box anyway?? So the box and the scroll get placed in a drawer for many years. Ask the Interpreter to read the rest. Odd. The rest of the words again seem to “call” you, but the language has no code on earth you can find. Who is the Interpreter? Becomes a consuming question. Frustration again breeds a lack of interest and the box and scroll find their drawer-home again. It doesn’t even occur to you to ask. So you ask…everyone you know. No one can read your scroll. You can not read theirs. Finally, you ask the “magic” question. To the Glory of God! 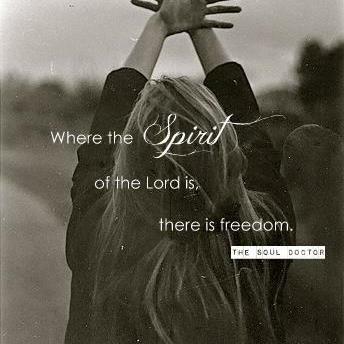 The Spirit! You return to your box and scroll. It defies logic to you…so I just ask the Spirit, whoever this is to read this to me?? The box rumbles in response to the thought…leaving no doubt – either you will ask and take a leap or return to your wait until next time. Spirit, I don’t know you, but I need you to interpret these instructions for me. The scroll flashes and momentarily blinds you. When your vision clears you see the first step of box-opening instructions, and begin. As soon as you are finished with the first. You return to reading and again…jibberish is all you see. Must I ask for each step?? You think. The box vibrates again. So you ask again for this mysterious Spirit to interpret the next set of steps. Flash, and the next step is plainly written. This pattern repeats many times. Finally…the box is opened and your life is never the same again. 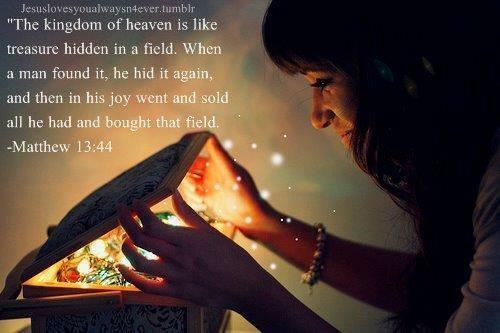 The treasure inside is yours and Gods alone. The Spirit and you become partners in everything, in essence you become friends. After finally opening the box, you share with the first person you can! You show your box and unroll your scroll; but sure enough to all who see them the box is plain and the scroll blank. You do, however, stop making “foolish” mistakes. Those that produce no fruit. Mistakes you make, but now they have meaning; especially when you ask the Spirit to “interpret” them. So dear friends, I ask you. Were the words the power to open the box? The answer, given that you have the correct Interpreter, is the meaning of the scripture above. 🙂 And indeed, every word that comes from the mouth of God. “Do not store up for yourselves wealth (treasures) here on earth, where moths and rust destroy, and burglars break in and steal. Instead, store up for yourselves wealth (treasures) in heaven, where neither moth nor rust destroys, and burglars do not break in or steal. For where your wealth (treasure) is, there your heart will be also. But the Counselor, the Ruach HaKodesh (Holy Spirit), whom the Father will send in My Name, will teach you everything; that is, He will remind you of everything I have said to you. When the Counselor comes, whom I will send you from the Father – the Spirit of Truth, who keeps going out from the Father – He will testify on My behalf. For anyone who keeps asking receives; he who keeps seeking finds; and to him who keeps knocking, the door will be opened. This is the confidence we have in His Presence: if we ask anything that accords with His will, He hears us. And if we know that He hears us – whatever we ask – then we know that we have what we have asked from Him.